I have been pondering death the past few days–since my mother met Jesus last Thursday evening. My reflections have brought to mind the song Empty Chairs and Empty Tables, the sad farewell from Marius to his friends in the musical Les Miserables. There are times in our lives where words fall short of what we need to express. Language has limits. There are particular griefs where words won’t work. You cannot help some griefs with a spoken word. The Lord anticipated this because He knows our frame; that we are from the dust (Psalm 103:14). Omniscient God not only enters into our pain, but He helps us to transcend our Adamic limitations. He does this by doing for us what we can’t do for ourselves. This kind of mercy is at the heart of the gospel. We can’t save ourselves, so our great God imposes Himself into our lives to rescue us (Ephesians 2:8-9). Likewise, we can’t overcome our grief unless He imposes Himself on our behalf (Philippians 2:6-7; Hebrews 2:14-15). The Lord helps us in our salvation and our sanctification. This week I have been experiencing the intervening and interceding work of the Spirit. He has quieted my soul and calmed my mind. He has left me comfortably speechless while providing groanings that are too deep for words. The Lord can be sweet this way. He has released me from the need to talk while choosing to speak on my behalf. Like ointment for the soul, His Words have been powerful and penetrating. He can parse out my need while working through the contours of the hurt. I can’t explain this, which mercifully is not a pre-requisite to experiencing it. Like an amputee who is compelled to scratch his leg, I reached down to scratch but was reminded that there is no leg. When a loved one dies, a part of us dies with them. Surely the eye can’t say to the hand, “I have no need of thee” (1 Corinthians 12:21). God knitted the human community into one fabric, and the amputating effect of death alters the whole. The dividing nature of sin creates a strange numbness. As it wears off, a new reality enters that requires a new and practical kind of grace. This type of grief is where the stabilizing power of the Word of God becomes irreplaceable. Though my words fall short, God’s Words not only fills in the gaps, but they elevate the soul to a place of understanding and comfort. God’s Word has been life to me this week. It has been restorative. One of the core tenets of my training is how the counselor is no different from the counselee. There is no counselor/counselee construct in God’s world as though one is superior to or isolated from the other. We’re all the same in that we serve both roles, depending on the need of the hour. I train my counselors to counsel God’s Word from experience, not from theory only, which means the counselor is his/her number one counselee. You advise yourself first and only then do you counsel others. Your counsel should be field tested on yourself before you instruct someone else. Otherwise, you run the risk of becoming detached from your counseling. You can be intellectual, but not experiential. You must be both. It’s like a preacher preaching a sermon that has not affected him. Though his words may be theological, accurate, and intellectual, he runs the risk of being a detached man. I don’t want to hear from a man who has not been affected by his message. I don’t want to be counseled by someone who is not able to counsel himself. My counselors must not be detached counselors. They must be affected men and women–counselors who have been counseled (impacted and changed) by God’s Word. God’s Word has an answer for what you are experiencing. I know this to be true because I have experienced the liberating power of God’s counsel in my life. This weekend I have been counseling myself, which has been good for my soul. 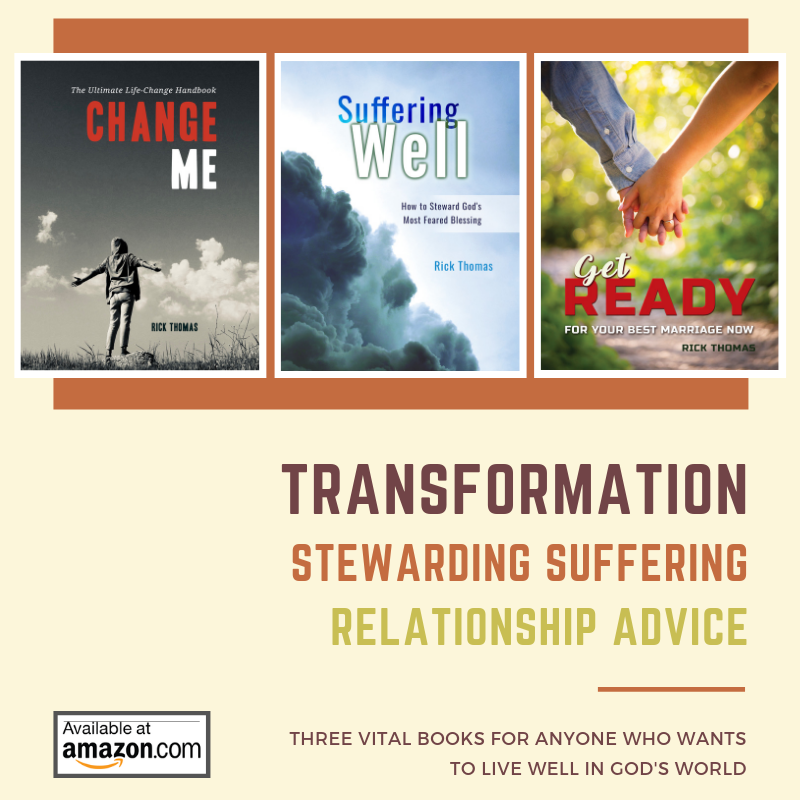 It has allowed me to think about many people I have counseled over the past few years. I have become them. Now I’m the one who is hurting. My empathy for them has grown. I have paid close attention to my counsel this weekend. Does it work? Is this what I need? How effective is my care? Am I being changed? In the movie The Dark Knight Rises, the enemy Bane told The Batman, “I learned here that there can be no true despair without hope.” The reverse is also true: there can be no true hope without despair (1 Corinthians 15:19). It has been my despair that has reminded me of the hope I have in Christ. The darker the night, the brighter the day. Though I am not fully living in the victory of God’s hope today, my despair reminds me of the hope I have in Christ. In time, the grace of God will displace the anguish of my soul. I do not feel the need to make this transition happen now. There is grace to wait; there is grace to grieve. In the days to come my despair will dissipate, and my hope will regain control of my soul. It always does. I have been here before. God has been faithful to me, and He will be faithful again. He cannot be otherwise (Hebrews 13:8). I rest in this. Appropriate grief is right. Feeling bad about feeling bad is not okay. Victory in Jesus does not mean there will be no weeping or perplexity of the soul (Psalm 42:5-6; John 11:35). To not grieve is not to be human (Romans 12:15). Grief is good. It is even better for the Christian because we know grief is not the final curtain call. Grief is a gift that allows us to hold steady in moments of darkness. The numbing effect of grief is a way to have a long goodbye. It keeps me in the moment of reflective thought. It would be inappropriate to move on as though mom’s life did not matter. Grief is like a tunnel that moves me from darkness to light. It gives me time to re-adjust to a new reality. I’m moving from the pain of sorrow to a re-calibrated victory in Jesus. Grief is the emotional anesthesia that gives me time to process what has happened. There will come a time when I will have to move on. And I will because I’m a Christian. I did not build my hope upon this terrestrial ball. I’m looking for a city in my eternal future (Hebrews 11:10). For now, I grieve–a gift from the Lord. In a few hours, I bury mom. Then I begin to appropriate the re-calibrating grace of God to my soul. I am coming to terms with sin and what sin does. Sin separates. Sin kills. I’m experiencing the damaging effects of the fall and its subsequent curse. I’m not special or unique. I’m like you. Sin, like a tornado sweeping through a community, leaves questions in its wake. I know this. I also know I will not get all the answers to my questions, and even if someone thoroughly explained things to me, it would not satisfy. How could I ever be satisfied with the death of someone? Emptiness and hurt are the ways of sin. Sin, and death because of sin, is cold and hard. There is no amount of clean up that can make it right. Only the return of Christ can fully restore the brokenness that sin brings. My mother lived, and she died. The road ended for her. It would be unwise for me to push beyond the stop sign as though more knowledge would make things right. The road ended and so must I. At some point, it is important for me to relax in God while trusting His ways as being superior to mine (Isaiah 55:8-9). I’m talking about mystery. The Lord taught me a long time ago to rest in mystery. There are some things that He reveals, and there are other things that He will never reveal (Deuteronomy 29:29). The key for me is to know the difference while praising Him for how He writes the script (Romans 8:28-30). I had a twisted mother. It is one of the many things she gave to me. She fed me mayonnaise for 30 years–until I found out potato salad had mayonnaise in it. I hate mayonnaise. I have always hated mayonnaise. She knew this. After I had learned how to make potato salad, I called mother and asked how she made hers. She immediately knew why I was asking and doubled over laughing at me. That’s my mom. I have a thousand memories like this of mom, and this is what I will choose to celebrate. It will be these stories that I will pass on to my children. Mom lived an imperfect life, but it does not matter anymore. Mom is guiltless before God, which is amazing to me. Guilt free is her permanent and eternal condition. I am stunned by the grace of God and eternally grateful that He would descend upon her, to save her, to make her guilt-free. I am so happy for her. It is impossible for me to fathom being sin free, guilt free, and pain-free. She has all three. She has experienced the faithfulness of God. Even when we are not faithful, God is faithful to us. I yearn for my time to see Jesus. One of the most amazing things about the Word of God is the assurance we get from Him that He will wipe all our tears and sorrows away. I have no idea how He is going to do this, but I believe Him. It has been this act of forward-looking that has helped me through my grief. When I look backward at what has happened, I shake my head in maddening disbelief. When I look forward, my heart begins to change. My faith receives a boost. It’s an amazing thing: God is going to make all things right. I do not understand this, but I choose to trust Him. These are just some of the ways I have counseled myself this weekend. God is so good to individuals, and His Word is faithful to anyone who wants to apply it to their lives. The grace of our LORD Jesus Christ is real, practical, and available to all. I am glad to be one of His children.